Use recombinant Streptococcus pyogenes Cas9 nuclease for genome editing, purified from an E. coli strain expressing the nuclease. Available in two versions, containing nuclear localization sequence (NLS), with or without a C-terminal 6XHis-tag, at 1 mg/ml. Works together with CRISPR-Fectin™ Transfection Reagent optimized for the delivery of Cas9-sgRNA ribonucleoprotein across cellular membrane. 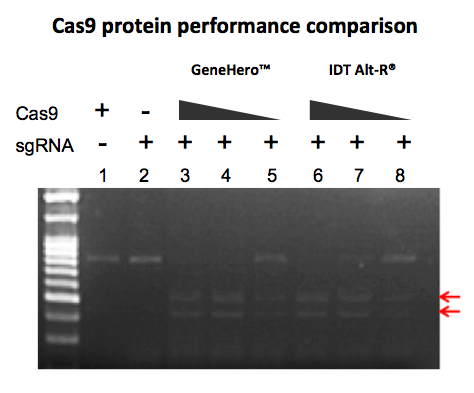 GeneHero™ Cas9 Nuclease (GE001 and GE003) in vitro cleavage of target DNA fragments and comparison with competitor’s Cas9 protein. Figure 1. HUWE DNA fragments were used as template. Three different sgRNA targeting the HUWE gene were designed and pre-incubated with Cas9 proteins respectively for the cleavage assay. Cleaved DNA bands are indicated by red marks. Ct, uncut HUWE DNA fragment control. Figure 2. Cas9 protein in vitro cleavage assay. HUWE DNA fragments were used as template. 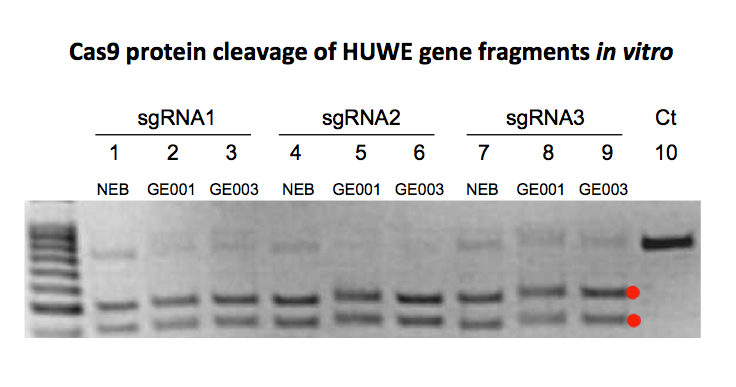 The sgRNA targeting the HUWE gene was pre-incubated with Cas9 protein for the cleavage assay. The GeneHero™ Cas9 Nuclease (lane 3-5) and IDT Alt-R® Cas9 nuclease (lane 6-8) were serial diluted from 250 ng, 100 ng to 50 ng per reaction. Cleaved DNA bands are indicated by red arrows. Lane 1, assay with Cas9 only; lane 2, assay with sgRNA only. 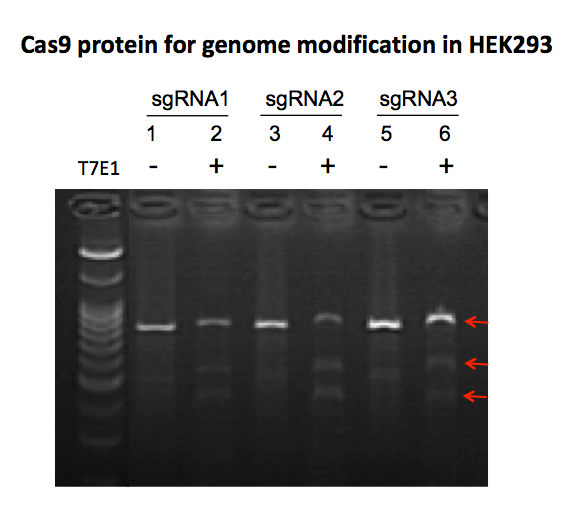 GeneHero™ Cas9 Nuclease genome modification in HEK293 cell line (Fig. 3). Cas9 nuclease was co-transfected with synthetic sgRNA into the HEK293 cells using CRISPR-Fectin™ Transfection Reagent. Three different sgRNA targeting the HUWE gene were designed and transfected with Cas9 protein respectively. The HUWE fragments were amplified from genomic DNA and subjected to the T7 endonuclease I assay. Cleaved DNA bands are indicated by red arrows. All Cas9 nulceases are dissolved in storage buffer at 1 mg/ml. This entry was posted in Genome editing tools. Bookmark the permalink.